Everyone has a bullying story. Whether it was the bigger kid who stole your lunch money, the kids who made you run home after school, or the kid who punched you every time he passed in the crowded hallway between classes. Bullies can be male or female, single or a group, child or adult. Bullying is intimidation, usually with at least an implied threat of physical harm. According to one statistic, over 160,000 kids stay home from school each day because they are afraid of bullying. 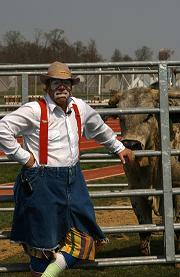 Nash, a professional rodeo clown and educator, has spent most of his life taking on nasty bulls in rodeo arenas all over the United States . Today, he is taking on bullies through Bullying Hurts, a community service program he developed with the help of his wife Darlene. Bullying Hurts focuses on positive youth development and prevention of the anti-social behavior of bullying in schools and communities . Nash hears many heartbreaking bullying stories each time he addresses a group about bullying. Bullying affects everyone. Even Taylor Swift, a popular teenage country music star, talked about her experience with bullies in junior high school during a one-hour country music radio special on Bullying Hurts, hosted by Charlie Daniels. Trisha Yearwood, Reba McIntire, Joe Nichols and Keith Anderson also talked about their experiences during the special which brought awareness of the problems of bullying to over 3 million listeners. Marvin's philosophy that people need three things to be successful in life—attention, support and education—guides the Bullying Hurts program. Bullying Hurts operates based on the idea that youth tend to learn the most from their peers. Marvin and Darlene developed the program to instruct high school students in groups such as Future Farmers of America or Student Council how to teach elementary students about identifying and dealing with bullying behavior. The high school students become mentors and role models for the younger students, resulting in a mutually beneficial relationship. 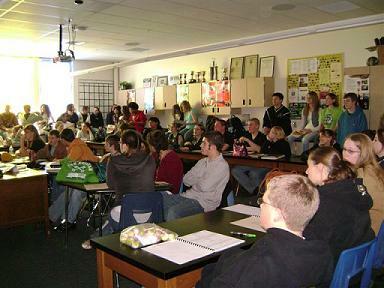 The program utilizes a DVD for the high school students to teach the elementary students about bullying in six sessions. The sessions are interactive, with the high school students asking the elementary kids to come up with answers to questions about bullying. The elementary students have workbooks to guide them and after each session there is a poster that stays in the classroom to highlight that session's message. During the first session, the kids discuss bullying behavior by filling in the statement, “A bully is someone that…” During, the second session the students discuss where to go to find support when they deal with a bullying situation. In session three, the students use a “support card” to identify support, attention and education. In session four, the kids talk about where bullying usually takes place. Session five includes discussions of how to identify bullies and how bullying makes people feel. Session six returns to the support card. Bullying Hurts teaches students that there are three victims in every bullying incident. The most obvious victim is the one getting picked on. The other two victims are not so obvious. “If you're afraid to say something because you're afraid that bully will turn on you next, you don't feel very good about yourself because you didn't do anything,” Marvin said. Marvin and Darlene held their first training session with the Bullying Hurts program in 20004. However, the foundations for the program began many years ago. Marvin studied education at Texas A&M but left school a few credits shy of graduation to become a professional rodeo clown. Nash's educational aspirations resurfaced when he attended a career day at his kids' Texas elementary school over 20 years ago. 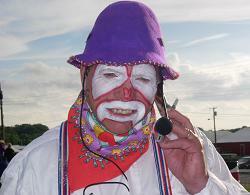 He went dressed in his colorful rodeo clown outfit and one of the teachers noticed that Nash was able to capture the kids' attention better than anybody. She encouraged him to work with kids—advice Nash took. He tried a series of anti-drug programs that didn't really take hold. Then he met a schoolteacher from Cherry Hill , New Jersey and told her about his past programs and ideas. She said that the biggest problem that needed to be addressed was bullying. It was all too fitting that Nash shift his focus from bulls to bullies. 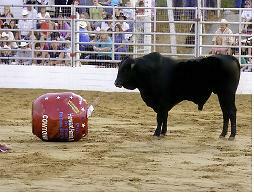 Bullying Hurts has taken hold all across the country, even in places where ranching and rodeo aren't common. 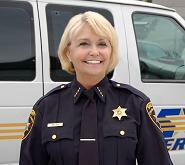 One of the Bullying Hurts program's biggest supporters is Sheriff Carolyn “Bunny” Welsh of Chester County, Pennsylvania . Rodeo is not something she was familiar with before meeting Nash. Sheriff Welsh learned about Bullying Hurts from a friend who regularly attended the Cowtown Rodeo in Woodstown , New Jersey where Marvin was working as clown and had talked to him about the program. Welsh was the first law enforcement official to become involved with the Bullying Hurts program. Sheriff Welsh invited the local police department to join in the program as well. The deputies and officers, in uniform, were present for all of the training and made themselves available to answer any questions. Sheriff Welsh feels that her officers' involvement in the Bullying Hurts program has helped establish relationships with kids that might otherwise have a negative image of law enforcement. The deputies discovered that the more they hung around, the more the high school kids began to open up to them. The law enforcement officers soon became a third tier of mentorship in the program. The officers mentored the high school kids and the high school kids, in turn, mentored the elementary kids. The mentoring foundation is the most unique aspect of the program to Sheriff Welsh. Sheriff Welsh especially likes that Bullying Hurts covers the three areas of bullying. Bullying Hurts also fits right in with Sheriff Welsh's belief that bullying prevention is crime prevention. After working with Sheriff Welsh and other Sheriff's around the country, and getting involved with the Department of Justice, the Bureau of Justice Assistance, and now USAonWatch, Bullying Hurts has expanded to include sheriff's departments and local police in each of the communities they visit. Law enforcement and other community volunteers can take part in the program by identifying and selecting high school students to participate, helping to organize the students, helping the high school students present their discussions about bullying to the elementary students, or even something as simple as driving the high school kids to the elementary school. Darlene has created a guidebook for all law enforcement to follow when they begin working with their community and the Bullying Hurts program. 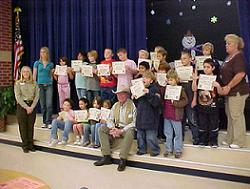 Another Sheriff that has participated in the Bullying Hurts program is Sheriff Bob Alford of Johnson County , Texas. Sheriff Alford found out about the program through a professional rodeo cowboy, Chad Eubanks, who was a good friend of Cody Nash, Marvin's son. The Johnson County Sheriff's Department prides itself in taking a proactive approach to helping children in its communities whenever possible. Like Sheriff Welsh, Sheriff Alford sees bullying as an issue that can start out small but become a major issue for schools and communities. The Bullying Hurts program continues to expand and reach new areas. Soon, Bullying Hurts will be holding workshops and trainings at five Boys and Girls Clubs around the country including: Nashua, New Hampshire; Indianapolis, Indiana; West Palm Beach, Florida; Salt Lake City, Utah; and Dine Nation, Arizona. For more information on the Bullying Hurts program, click on bullyinghurts.com, call (307) 254-0603 or email bullyinghurts@aol.com .